Human psychology is rife with contradictions: We work hard to achieve our goals, but when we succeed, our happiness is fleeting compared with our efforts. We hope our friends will do well in life but can't help but feel jealous if they do too well. We're aghast at the thought of people we know being murdered, even if we despise them, but are unconcerned when our armed forces kill enemies who are strangers to us. We complain about difficult bosses but are often just as bad when we're in charge. These inconsistencies may seem irrational, but each of them has evolved to serve a vital function in our lives. Indeed, the most fundamental aspects of our psychology were permanently shaped by the "social leap" our ancestors made from the rainforest to the savannah. In their struggle to survive on the open grasslands, our ancestors prioritized teamwork and sociality over physical prowess, creating an entirely new kind of intelligence that would forever alter our place on this planet. 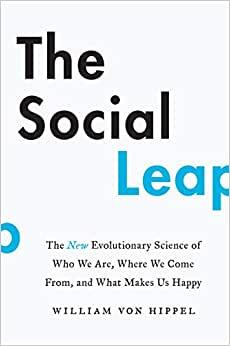 Blending anthropology, biology, history, and psychology with evolutionary science, The Social Leap is a fresh, provocative look at our species that provides new clues about who we are, why we do what we do, and how to live the good life. 5.0 out of 5 starsThe evolutionary basis of who we are! Von Hippel's personality shines through in this easy-to-read book on human psychology (see his Joe Rogan podcast if you don't believe me!) This is science at its best -- engaging from the first word. I highly recommend it! I just bought this book less than an hour ago (updated: I have now had the book for 24 hours). But I'm already running into problems. As an avid follower of anything that makes us human, I know I will enjoy this book even despite the faults. Hippel is charming and very knowledgeable. He focuses on aspects of human evolution that other scholars ignore. The writing is engaging and crisp. But there are some scientifically painful moments and I will highlight them as I read. So, this review will be updated as I move forward. The first real ouch comes right in the preface. It is there where Hippel is building his central ideas. But he does so in a fashion that strikes this reader as deceitful. In a section about the evolutionary roots of sharing and cooperation, Hippel talks about how chimps differ from humans in that they really have no rules at all when it comes to food sharing. He writes: "chimps who only watch the hunt are just as likely to end up with a monkey snack as chimps who join the hunting party. Their fellow chimps make little or no distinction between slackers and helpers. In sharp contrast, even children as young as four are attentive to who helps and who doesn’t." What!?!?? Everything I had ever read suggests the precise opposite. Nevertheless, I spent a half hour trying to find the evidence Hippel used to support this argument. Nothing to be found and his references aren't listed. I did, however, find considerable evidence to suggest that chimps do share food based on social networks and rules – quite the opposite of Hippel's conclusion. In chimps food sharing is based off of grooming relationships, barter, harassment, fear etc. Justice does matter. And it matters even in capuchins (as shown in a paper he does cite in his book). Yet, despite the deep academic consensus on this point, Hippel confidently cherry picks data (that I couldn't find) and states his claim in a way that sounds like it is a universally agreed upon conclusion. As such Hippel would either need to refute the other claims or at the least acknowledge they exist. Early into chapter one, Hippel is at it again. He writes about moments of his youth, how he and his friends would protect himself from hoards of dogs by throwing rocks. This is a fun observation and likely a human universal. But Hippel adds personal nuance to this story. And h confidently leads the reader into his theoretical web with an anecdote that strikes me as false. Hippel mentions that when he was in a group or even just with his brother they would (by instinct?) defend themselves by hurling rocks at groups of attacking stray dogs, but as soon as Hippel was alone he would respond (again by instinct?) in a different fashion – running to the nearest tree and climbing up before the dogs could reach him. Recall that the title of the book is the "Social Leap" so Hippel needs to make clear distinctions between a lone human and a social human. And so he does this hear. But wow. This is not science. Nor is it even likely true. Like Hippel I've been in numerous scary situations with packs of dogs (once I was in Chile facing a pack of fifty dogs running at me, fortunately they continued to run right by me) and the last thing I have ever thought when I have seen dogs running at me is to turn and run for a tree. Dogs are so fast. The last thing I've ever thought in those situations is to turn my back and run. Running away leads dogs to get even more aggressive. And even when alone, facing many packs of dogs (as I did once late at night in Holland) like Hippel, I have merely pretended to reach down for a rock and the dogs turn in their tracks - precisely as Hippel describes. So, while its an interesting observation that Hippel makes, it feels entirely contrived, and certainly is based on nothing more than personal anecdote – not quite the data one requires for scientific inquiry. At this stage in the book we need science and statistics not invention. Show us a study which shows that little boys run for the trees when they are alone and then stand their ground when they are in pairs. Otherwise risk alienating the reader. Moving forward we continue to run into more striking problems. Hippel pushes forward with his somewhat fishy notions of group selection – a topic that is not well supported by academics. And he does this using bogus data. On page 31 he writes about humans having evolved the sclera (the whites of our eyes) and how chimps don’t have them. This is just patently false. And I’ve posted a still from the recent documentary “Rise of the Warrior Apes” showing the chimp Pincer with eye whites precisely as they exist in humans. Worse, Hippel reaches far outside the evidence and claims that the sclera evolved for reasons of group selection. While this is an interesting guess, there is no evidence to back this up. And so once again he uses false information and then bundles that up in conjecture. Worse, this is further used to bolster his suspect ideas of group selection. That said, I do agree with some of Hippel's stronger points. I really enjoy how he underlines the fatalistic (not deterministic) nature of many aspects of human evolution. He avoids the cliches of "proto-humans climbed downed the trees and took over the land." Instead he rightfully notes that proto-humans were likely victims of many disasters. And so instead of us leaving the trees the trees left us. And he investigates the geological history to build this argument. This work is very satisfying. Further, he claims that cooperation is one of the most powerful innovations of humanity – the Social Leap. It is just unfortunate that he appears to be building the evolution of cooperation on conjecture and perhaps even a fair amount of weed smoke. On page 28, he takes a deep dive into the work of Barbara Isaac who suggested in a paper from 1987 that stone throwing played a much more significant role in human evolution than scholars have noted. I suspect Isaac is right about this. But Isaac's writing is much more cautious. She is quick to point out how little data there is. And when she cites the work of historians she is careful to note the problems with the citations. Hippel grabs from her paper readily, using many of her citations, but leaves out her caution. This is dangerous. Because as Hippel suggests in his dog story, stone throwing appears ideally suited for defense, but Hippel goes forward to suggest that it is a powerful method for hunting as well. But the evidence for stone use in hunting is scant. And personally it just feels wrong. Even a great major league pitcher like Nolan Ryan or Roger Clemens would likely find hunting difficult by throwing stones. I reserve my red highlighter pen for suspect writing. I use blue for great stuff. I use yellow for interesting. And again, while Hippel delivers a fun book, where I have used both the blue and the yellow often, there is just far too much red to recommend this book highly. That said, I am still very excited to continue reading and digging deeper into this book. He is a fun thinker and I have enjoyed his focus on Australopithecus and the transition to the savannah. This is very fresh stuff. As such, I will continue adding to this review....stay tuned. I really, really enjoyed the Social Leap. The book makes a very interesting and persuasive case that much of what makes us uniquely human—our psychology, intelligence and what we find meaningful in our lives—can be traced to our evolutionary past, and especially to how our chimp-like ancestors made the transition from trees to the savannah six million years ago. Our ancestors were forced from the safety of trees on to the savannah in Africa, and this was very dangerous. There were larger, faster, stronger predators in the savannah and it was only because of several lucky accidents—including especially the fact that we learned to cooperate—that we came to dominate the savannah and, subsequently, every environment we moved into. There is a lot of nuance and luck in our history and it is all told well in the Social Leap. We stood upright (became bipedal) and freed our hands to throw stones, make tools, and dominate larger creatures; we discovered fire which enabled us to release the nutrients in food and grow our brains; we learned how to divide labor and specialize. The book describes all of this and much more in way that is readable, interesting and thought-provoking. Psychology studies are described clearly and simply—something I haven’t found all that often in books of this type. The Social Leap also explains much of our current psychology. Why we ruminate endlessly about other people and social situations, for example, and why we aren’t as individuals terribly innovative (except in social situations). The last few chapters discuss what we can learn from evolutionary insights to improve our happiness and life satisfaction. And while I wasn’t persuaded by everything that is written about happiness, I do believe that though evolutionary insights may not be enough by themselves to inform a happy and productive life, they must be taken account of or we risk kidding ourselves about what will make us truly happy. • We evolved to be upright and bipedal, which also enable us to throw stones. If you practice throwing stones, and especially if you throw stones in groups, you can be deadly, even against much stronger and larger animals. • Our intelligence and complexity of thought came about not to solve natural problems like hunting prey, but to navigate the far more complicated and dynamic situations that result interactions with other humans. Are others freeloading, are they plotting against me, is my mate cheating, etc. Social dynamics are extremely complicated, rapidly changing, and it is only by developing very sophisticated thinking that we could cope with this challenge. • The white around our pupils is evidence that we evolved so that others can tell what we are looking at. This helps drive cooperation, and surprisingly, is not true, for example, of chimpanzees. • Much of what we do to become good at things—like sports or chess or whatever—is motivated by our need to more sexually attractive than rivals. • We deceive ourselves in many ways, such as how attractive we are. This enables us to deceive others. • Leaders are more likely to become domineering, greedy, immoral and exploitative when resources can be monopolized. There is much, much more that I found deeply fascinating. And it is all clearly explained. This book gave me many new perspectives on my behavior and thinking patterns, and is one of the best I have read in a long time. This was an amazing book. Professor Hippel brilliantly explains why we are how we are. It helped me understand my self better as a human being. More folks should read this!